@William - I love the book, and I love this passage. 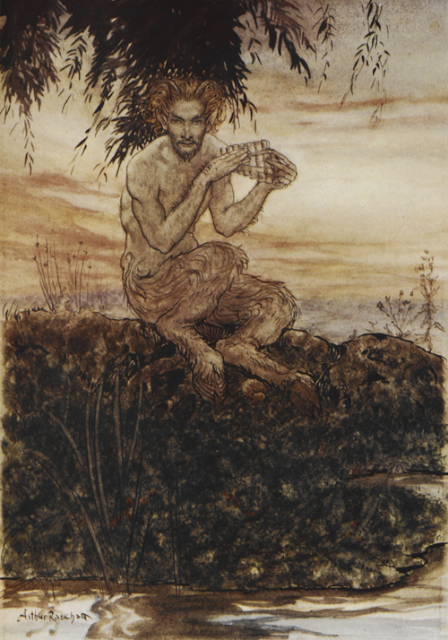 But as you say, this 'paganism' was (by contrast with nowadays) deeply Christianised by a childhood and school experiences, and the nature of Victorian society - and I think you get it exactly right when you express Pan's implicit nature here. The Wind in the Willows is a book with a very good heart - excepting, I would say, the shallower chapters, focused on the antiheroic and annoying character of Toad. But Rat, Mole and Badger are among the most decent, lovable and admirable characters in all of English Literature. Yes, it's a wonderful book and I agree that Toad is annoying. I also liked the chapter when Rat is almost lured to leave home and go travelling by the tall tales of another wayfaring rat. At least i think I've got that right. It's ages since I read the book. I had no idea Kenneth Graham was what you say he was. All I knew of him was this book. You're right in everything you say about the Pan episode. As a kid I found it deeply numinous and religious and I feel absolutely the same way about it now. 'The Piper at the Gates of Dawn' became, of course, the title of Pink Floyd's first album. I saw a play around 2009 in Manchester's Library Theatre (now sadly gone) set in Cambridge in the summer of 67 about a disillusioned Marxist academic. It sounds dire, I know, but it was really rather excellent. It had little cameos in it to do with Syd Barrett and I remember one bit where Pan appeared in a suburban garden while a mysterious pipe music filled the air. So, one of the chapters my teacher (who was otherwise fantastic) judged superfluous has turned out to have had a significant and ongoing cultural and spiritual impact. 'The stone that the builders rejected,' etc. Actually, I think the play was set in the 90s but with flashbacks to 67. I also agree with what you say about nature being suffused with the Divine. 'The world is charged with the grandeur of God' as Gerald Manly Hopkins wrote. In Orthodox theology, I believe, everything in the world - animate and inanimate - is viewed as an emanation of the Logos. Everything has its own divine spark, it's own mini-Logos (Logoi, I think it's called.) The Greek Orthodox poet, Philip Sherrrard, wrote a lot about this, as did the Catholic, Stratford Caldecott. But you're right, this is an aspect which has indeed been neglected. The trouble is that when and where one does find it in the world of English spirituality it seems to come wrapped up in a mild but noticeable anti-Christian bias, e.g. the work of Philip Carr-Gomm, Chief Druid of the Order of Bards, Ovates and Druids. I don't believe Albion will awaken until there's a better understanding between pagans and Christians in this country. CS Lewis was, I think, the greatest bridge-builder of all in this respect, but reading and reflecting on The Wind in the Willows would massively help bridge the gap as well. I know the idea of God being present within creation certainly exists in Christianity. But it's rather on the edges and among mystics and poets. In mainstream Christianity it tends to be overlooked. I agree that paganism and Christianity can learn from each other but it's rather like Pan and Christ. The former must be seen in the overall context of the latter. That was probably the case for early Celtic Christianity which has always had a strong sppeal for me, perhaps because of a Scottish grandfather and an Irish grandmother. The other side is Yorkshire which I like to think keeps my feet on the ground!